15 times "Best Art Director Award" Winner in Rome, Italy. Art Director, Performer & Dancer, Writer, Producer, Vintage Music from the 70’s 80’s and 90's. Opinion leader, Radio & TV AncorMan, Singer, Actor (performing in “The Great Beauty ” 2014 Academy Award winner for best Foreign Language film)!!! Since 2000, each Friday of the week, he organizes "The 70's, 80's and 90's Party" which is the most followed and attractive event in Rome. He also travels all around Italy and Europe with his "Gruppone" organization. 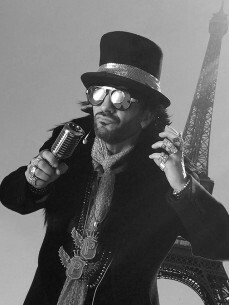 As a singer he has recently released his new single "Dolce Vita 2k16"produced in cooperation with Ryan Paris, a modern and adapted version of the famous 1983 hit Dolce Vita by Ryan Paris, winner of prestigious awards all over the world. A multifaceted and talented artist, with his charisma and sympathy, he communicates an incredible energy from the stage every time he performs in his show.